With the gradual opening up of the Indian economy since 1991 across various sectors has made the Indian market very competitive. Gone are the days when one had to wait for years to get a telephone line connection, to get a scooter, a loan or a car. The times have changed. Instead today companies and marketers are chasing consumers with a variety of products at different price points, in different locations and different quality. Customers today have more options in almost everything – food and beverage, nondurable goods, durable goods, apparel, telecommunication, transportation, banking and financial services. As India’s economy has grown, so too has the spending power of people – real average household income in India has roughly doubled over the past two decades. The cost-cutting that we see these days is not a sign of brand dilution, but an attempt to address the needs of deprived and low income groups of India. It would be wrong to generalize and say that Indian consumers today are cleverer and have made “price” the name of the game. There is an increasing trend of brand consciousness amongst the rising middle class, besides the wealthy segment of the population, with rapid growth in disposable incomes, the development of modern urban lifestyles. It is important to understand the Indian consumer psychology across different income groups and across various product categories. Most Indians are not necessarily looking at the cheapest, but a good quality of product/ service, which gives value for money. The perspective on price differs from segment to segment. As far as low income groups are concerned, manufacturers are increasingly focusing on operational efficiency to reduce costs and pass on the same to these highly price sensitive consumers. The lower middle class has a great emphasis on value for money and looks for low to medium pricing. Amongst the upper middle class and high income class segments, price sensitivity is not very high and brand value, innovation and product quality are considered very important. The perspective from a product category offers interesting insights. As Indians have grown richer, they have begun to spend more on durable goods and life-style products, entertainment and become very global. Indians also demand brands that reflect local preferences. Companies such as Hindustan Lever, Nokia and Motorola have introduced multiple products to suit Indian taste and preferences in terms of price, quality, variety, etc. Indian consumers are becoming increasingly sophisticated and knowledgeable about products. Increasingly brands have to be associated with value for most segments. 1. Demographics – India has considerable demographic advantage as compared to most developed nations such as Japan and USA. Most developed and emerging economies which will see their working-age populations decline as a proportion of the total in the next two decades and they are already realizing that they have an aging workforce. India has a relatively very young working population, in fact the largest young population in the world and 54 per cent of India’s population is below 25 years of age, 60% are below 30 years of age and 80 per cent are below 45 years. The young generation with an increasing purchasing power would drive overall personal consumption due to its emphasis on “look and feel good” factors. This demographic segment would also force companies to bring operational efficiency and innovation to markets. 2. Decline in ‘deprived’ and ‘aspirers’ population proportion – With a favorable labor market and increase in entry and expansion of MNC and domestic firms, there would be decline in the lower income segments of the economy. 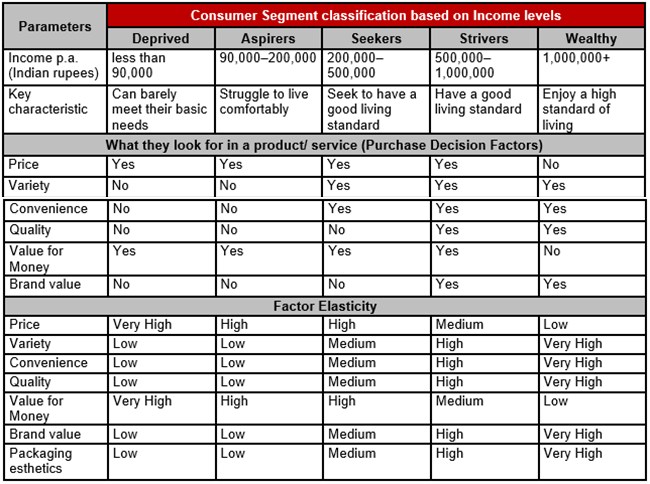 People from the deprived sector would move to the aspirers segment and people from aspirers segment would move to seekers or strivers segment. 3. Dominance of middle class – The middle class (seekers and strivers segments, as defined by NCAER), will continue to grow fast and India is projected to be dominated by middle class segments. Earlier the deprived and aspirer segments formed the major chunk of India, but now a middle class is clearly emerging as the dominant segment. The growth in this segment will wield significant purchasing power. 4. Growth in the ‘wealthy’ segment – It would drive the ‘low price sensitive and Brand conscious’ mindset. They would have spending habits encompassing vacations abroad, high end electronics, high end cars, Designer/ branded apparel, etc. Premium brands such as Tommy Hilfiger, Tag Heuer, Louis Vuitton, Christian Dior and Swatch are already present in India; many others, such as Armani, Gucci, and Versace are on their way. India offers immense opportunity to companies that are willing and prepared to innovate, adapt, and develop a deep understanding of Indian consumers. Businesses will not be constrained by a lack of opportunities. If at all they would be constrained, it would be because of lack of creativity, innovation, ambition. To succeed, companies will need to be prepared to exploit the opportunities offered by the Indian consumer market. educational and media sophistication, consumers today are becoming smarter. One can not sell a global brand at a global price in India, unless it is targeted at the ‘wealthy’ segment (brands such as Louis Vuitton, Tag Heuer, Christian Dior, Swatch, and Tommy Hilfiger). Companies would need to customize its products, prices, distribution and promotion to suit Indian consumer preferences. For examples, Nokia and Motorola have introduced multiple mobile handsets at different price points and with characteristics that would suit Indian consumers. LG and other have Indian menus on single touch in their microwaves. 2. Reduce cost of customer entry – Since a large number of population would still have a limited pocket, companies would need to reduce the consumer cost of entry into product categories by providing easy, flexible and convenient payment options such as bank financing, pay-per-use, and community ownership. These practices are currently successfully followed in various segments such as cars, TV, AC, motorcycles, PCs, etc. Extending this philosophy to other areas would considerably drive up consumption and get more of first time users, apart from repeat users/ customers. 3. Increasing affordability and room for experimentation – Companies would also need to ensure that more and more people have access to a product in an affordable way. People have risk preferring when stakes are very small. Hence, a sachet based approach would encourage people to take risk and try out products. Also, since the base becomes very small, people don’t feel the pinch of spending on things like shampoo, hair oil, detergents, face cream, body lotion, tooth powder, etc. The sachet based distribution is an innovative marketing solution to reach to the bottom of the pyramid. Many companies have started offering small packages or sachets of personal care products are offered at low price points. 4. Educate the consumer – Mere localizing price and product attributes might not suffice to create demand. Market segments lack symmetric information and awareness. Since many Indian consumer markets are in the early stages of development (such as the bottom of the pyramid and aspirers segment), companies would need to educate them with considerable patience and investment. This drive would certainly yield significant long-term results for the company that invests in this exercise. Washing machines, air conditioners and beauty products are good examples of markets where pioneers in consumer education enjoyed considerable market share. 5. Operational Efficiency – In order to tap the low income yet significant segments of Indian consumer market, companies would need to attain operational efficiency in their operations, so that they sell products that consumers would find affordable. 6. Competitive advantage through an efficient and effective distribution network – India’s sheer size and presence of highly fragmented retail market (dominated by mom-and-pop stores) poses an obvious problem with distribution. Solving this problem can create a significant competitive advantage for a company. Since building a network of one’s own is very timeconsuming and expensive, companies will have to leverage a third-party network. However, besides mom-and-pop shops, the emergence of organized retail will also pose a challenge to companies, which have come up successfully with many private labels such as Food Baazar, Food World, Spencers’, Fabmall, Shoopers’ Stop, Globus, Pantaloons and Westside. This would force companies to lay all the more emphasis learning to manage a widespread distribution network and navigate the modern retailing sector. 7. Rural Marketing – A significant portion of the ‘deprived’ and ‘aspirers’ (bottom of the pyramid) reside in rural India. In order to tap the huge untapped potential that these segments have, companies have begun to lay emphasis on rural marketing. 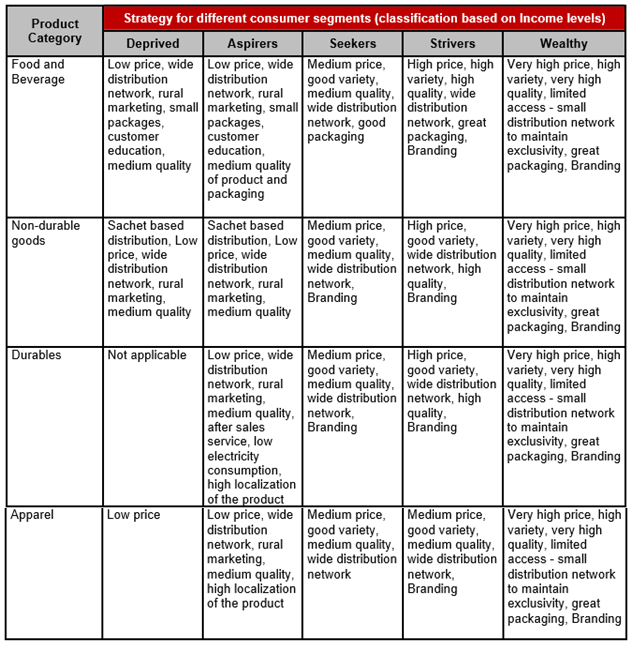 Amongst the four ‘P’s of marketing – product, pricing, promotion and place, companies have come up with innovation with respect to place (or distribution). Well known examples of this are Hindustan Lever’s Shakti initiative and ITC’s e-chaupal initiative, which have targeted to empower rural population by giving them an opportunity to be a part of the distribution system (bypassing all middlemen) and increase their purchasing power. Distribution channels are extremely important in ensuring the success of a company’s rural marketing efforts. It is imperative that products are priced low, profit margins are kept to the minimum and the marketing message is simple, in order to be successful in the rural marketing initiative.